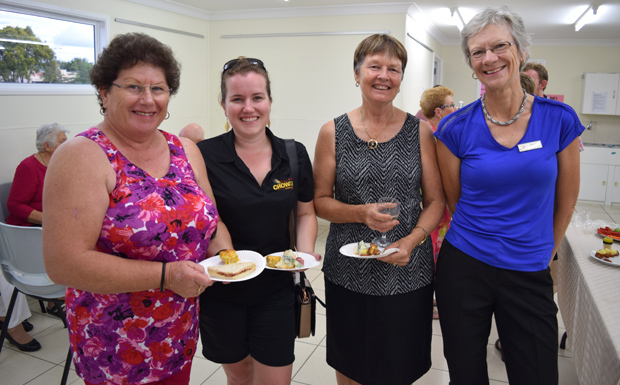 A large crowd packed the Wondai Regional Art Gallery on Friday night to welcome in a new year of exhibitions, and begin preparing themselves for change. Long-serving curator Elaine Madill – who received an OAM in the 2019 Australia Day awards – announced she will be stepping down from her position at this year’s Annual General Meeting which will be held soon. Elaine said she still intended to play an active role in the gallery, but believed the time had come for a new hand at the helm of an organisation that has steadily grown to become one of the most successful art galleries in regional Queensland. Elaine told the audience at Friday night’s opening that the gallery’s alliance with Brisbane’s Gallery Of Modern Art would mean more free arts activities for children in February, March and April (see separate report). Extensions to the Wondai Gallery’s kitchen and a new storeroom to house packing materials from travelling exhibitions are also close to completion. Elaine said the gallery’s monthly exhibition schedule was also booked out until mid-2021. 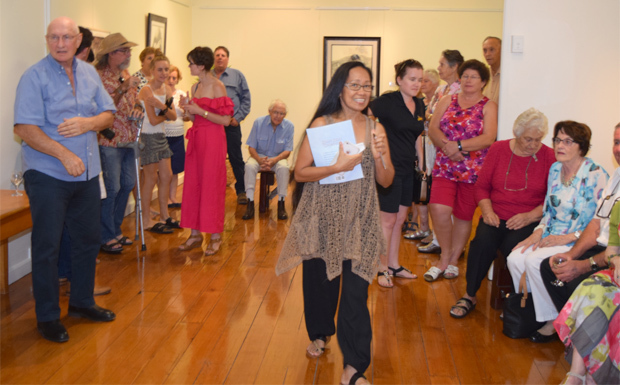 She was particularly proud the schedule for Kidz Korner – which features artworks by students from a different local primary school each month – was also solidly packed. Kidz Korner encouraged children to think of the gallery as a welcoming place and helped to create the next generation of artists. 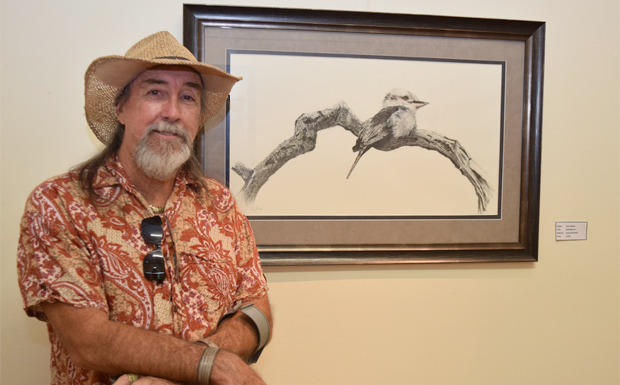 This month’s exhibition features photographs by Heather Stanton and Sharron McDonald in the front gallery, along with “Slow Progression” – a 10-year retrospective of charcoal works by Tony Adams – in the main gallery. Heather and Sharron’s photos encompass everything from macro views of flowers through to photographs of exotic animals and landscapes shot on holidays. Many are on canvas, but the exhibition also features some photos which have received unusual treatments, including one printed onto glass. 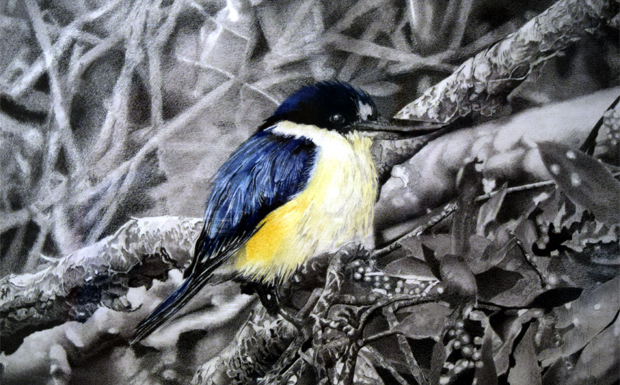 Tony Adams’ exhibition largely focusses on birds which have all carefully sketched in charcoal. He estimated an average work took him a minimum of 60 hours to produce, and some much more. Several of his works have previously been seen at the Wondai Gallery, but the bulk of the exhibition features new material. Tony said he plans to move into painting in the near future, and possibly portraiture, and is looking forward to the challenge. In the third gallery, former Linville artist Helenna Dohle and her photographer partner Stuart Efstathis explore different views of people and landscapes in “Australia Through Our Eyes”, a collection of artworks and photographs. 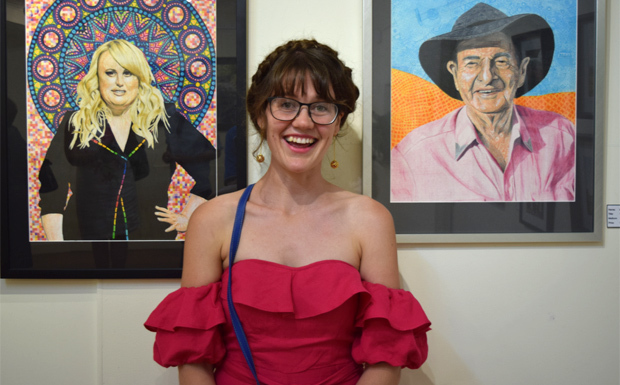 Helenna’s work hasn’t been seen at the gallery for at least two years and her latest works focus on famous Australians such as Rebel Wilson and Slim Dusty. But rather than being simple portraits, the skin of each subject has been overlaid with meticulous designs. Helenna, who recently moved from Linville to Brisbane, said she spent many hours creating this tattoo-like effect, and thought it added something extra to the subjects of her pieces. 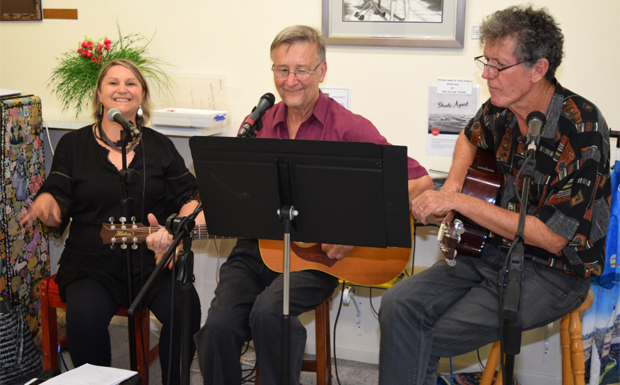 “In Focus”, “Slow Progression” and “Australia Through Our Eyes” will remain on display the Gallery on the roundabout in Wondai from 10:00am to 4:00pm daily until the end of February; admission to view the exhibitions is free. 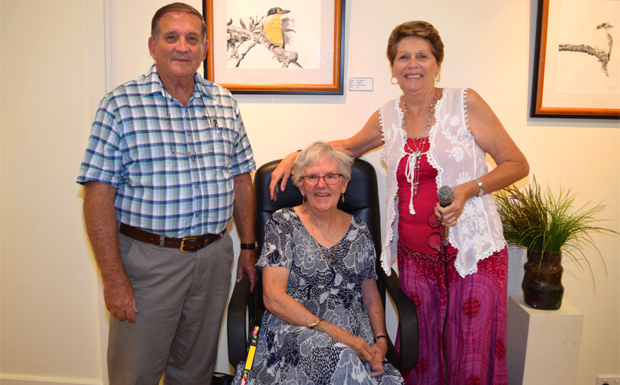 The Wondai Regional Art Gallery’s April exhibition will be the annual Wondai Garden Expo Art Competition, where all entries are required to have a garden theme but can be constructed in any medium. The competition offers more than $2000 in cash prizes and is open to both adults and children from the ages of 4 to 17, in three different age categories.